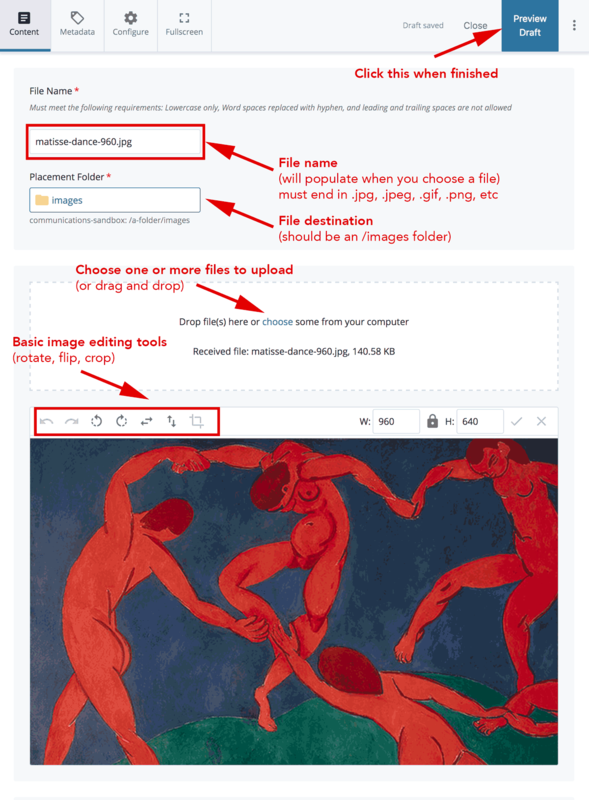 To use an image or a document (such as a PDF) on your website, you need to first upload it to Cascade. Copyright Note: As a reminder, editors should only use images for which Brandeis holds the copyright (taken by the university photographer) or stock images that they have purchased rights to use. Create separate folders for images and documents — this will make finding things easier later. Prepare your images before uploading using Photoshop or similar software. This will help prevent image distortion and long page load time caused by large files. Use PDFs sparingly. PDFs must be made accessible before being uploaded. Visit the Sizing and Editing Images page to review a list of appropriate image sizes. Best Practice: We recommend Adobe Photoshop for image editing. More information is available at go.brandeis.edu/software. 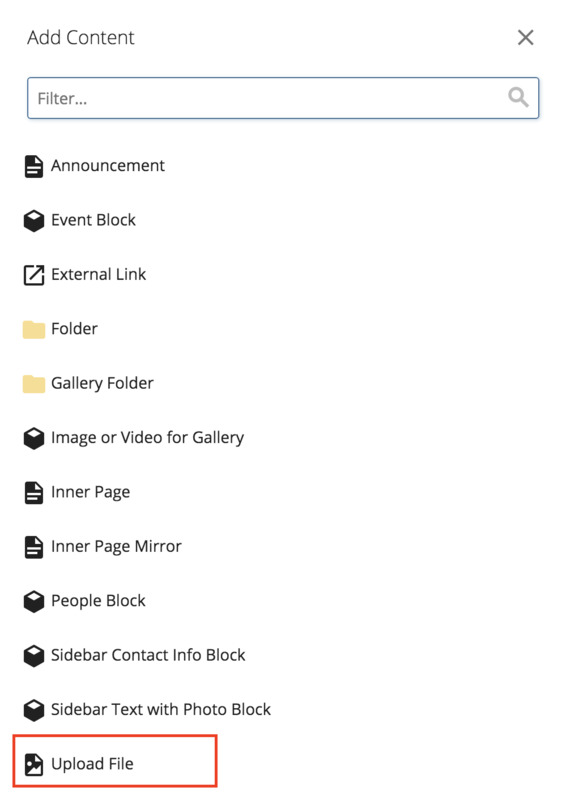 In the Site Content menu, select the folder into which you would like to upload the file. From the toolbar, select the (+)Add Content menu. Then, select Upload File. Browse method: To browse to your image, click the word "choose" in the dotted-line rectangle. Locate and select one or more files on your computer. Then click Open. Drag-and-drop method: Or, simply select one (or more) files from your desktop and drag it into the “Drop file here to upload” rectangle. Your image(s) will appear on the screen. The file name of the file you uploaded will appear in the File Name box. Your image will appear under, where you can perform basic image editing. edit the size or orientation (as a reminder, images should be sized properly before uploaded to the CMS). If the file you uploaded has spaces or capital letters in its File Name, please follow step 5. If not, skip to step 6. You must remove spaces in filenames to prevent broken images and links. Enter a new File Name for the file by deleting spaces and/or changing capital letters to lowercase letters. This is the name that will appear in the navigation panel and as part of the URL of the file. Be sure to include the file type, i.e., .jpg, .pdf, etc., in the title. Best Practice: Keep names short; use only lowercase letters, numbers, and dashes. Do not use spaces or underscores. ﻿Once you are done, click the three dots ("kabob" menu) next to Preview Draft at the top right. Click the blue Check Content & Submit button, then click the checkbox to save your work. The file will appear in the specified folder in the system. You can now use it on a page. Simply follow the instructions above, but instead of selecting or dragging a single file, you can select or drag multiple files. This works with both the "Browse" method and the "Drag and Drop" method. It works with PDFs and image files. After the files upload, you will see the screen below, then simply click Submit. 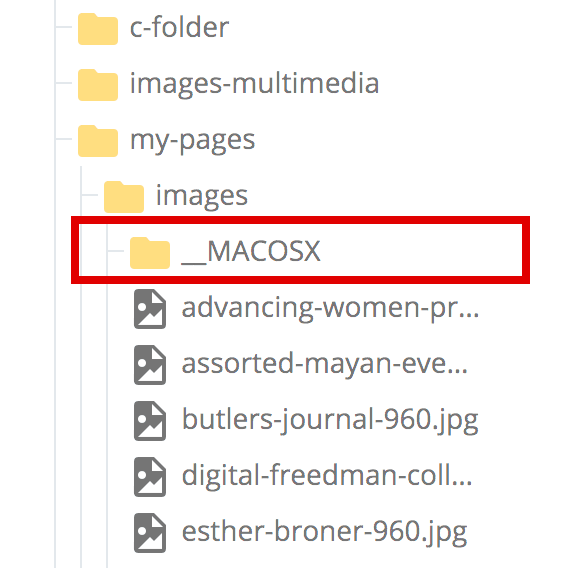 Mac users may see a folder Mac_OSX imported with your images. This folder and all its contents may be safely deleted. If you've previously uploaded a file to Cascade, you can update/replace it with a newer version without starting from scratch. Replacing the file has a major advantage: the links you and other web editors have created will be maintained by Cascade. Select the file you need to update. Click Edit. 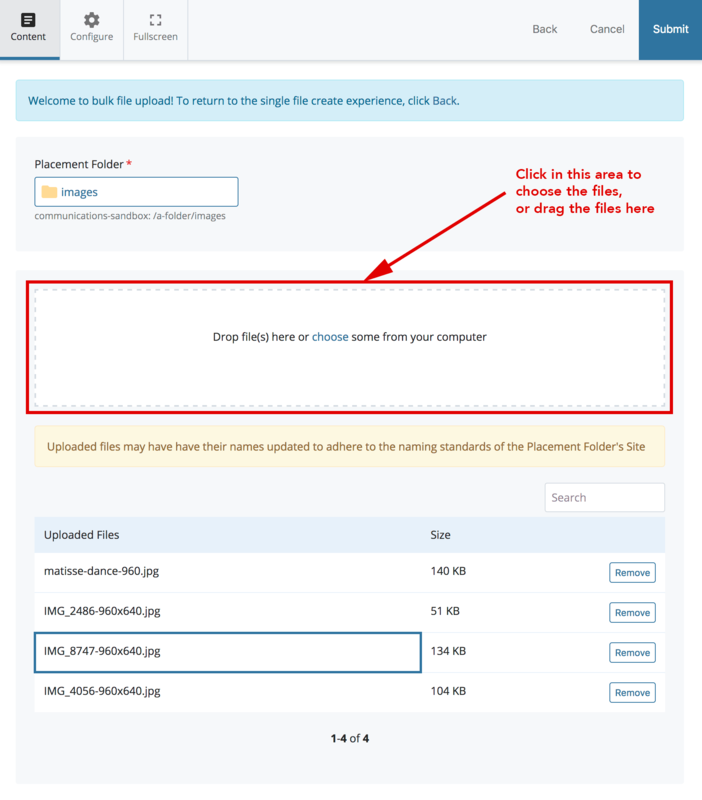 Using the Browse button or “drag and drop” functionality, upload the new version of the file to the CMS. 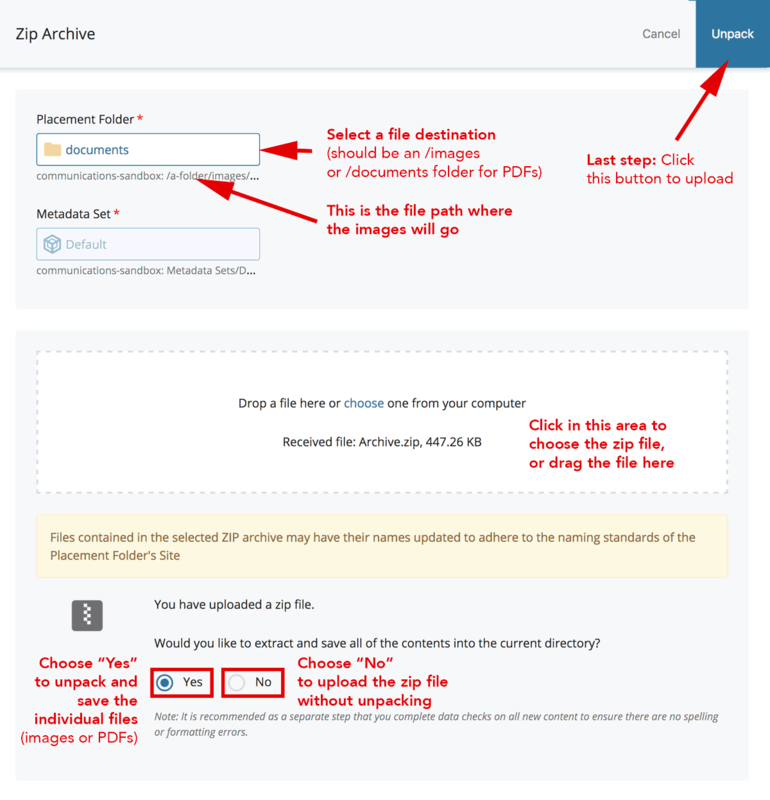 For instructions, see "Uploading a File (PDF, image)" above. Once you select the file, its file name will appear next to Received file. Click Submit. The new file will appear using the old file name. 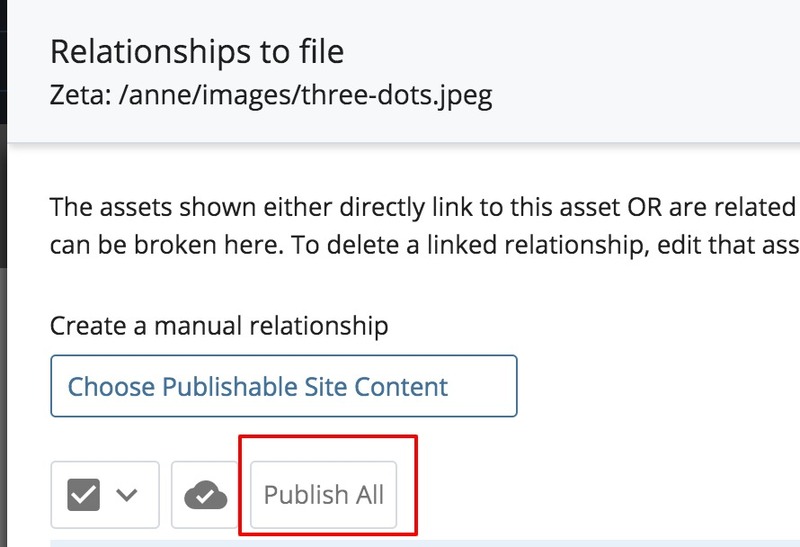 While the file is selected, click on Relationships. The pages with links to the file will be displayed. If you need to rename a file, follow the Move/Rename instructions. 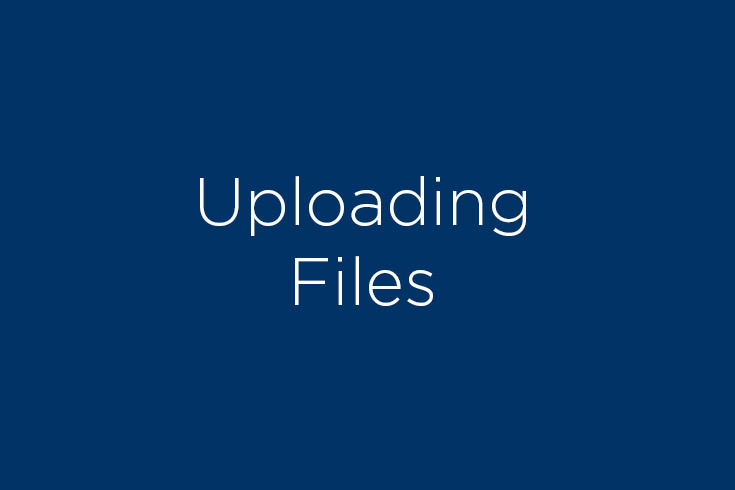 This video demonstrates how to upload two image files into an images folder. It also shows how the system corrects file names that do not adhere to asset naming rules.